Price : 1.180€ | Deposit : 2500€ | Agency fee 3 to 5 months : 1059€ | Agency fee 5 to 11 months : 1513€ . 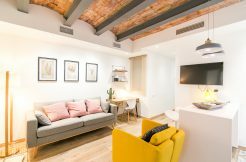 Front of the monastery Sant Pau del Camp in the district of Raval (“ciutat vella”, old town), in a building completely renovated in 2016 with lift and all amenities, this is a two bedroom’s apartment fully equipped with appliances and furnished as on photos. A double room with toilet and a single room. Building very quiet and no noise. Close to the L3 Parallel green metro line.